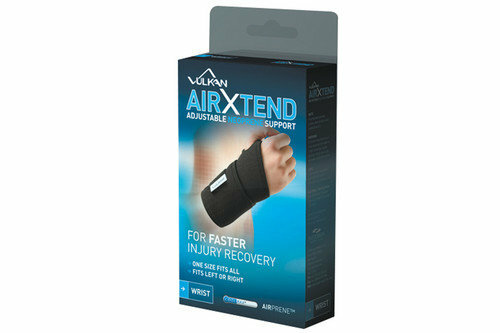 Accelerate your healing process and get back in action with the Vulkan Airxtend Wrist Support. For faster injury recovery, the soft neoprene helps retain heat at the source of the injury by increasing blood flow and oxygen to the damaged tissues. A simple concept which sees the support designed with adjustable tension straps to offer controlled compression and a bespoke fit without compromising on movement. Although bringing plenty of heat to your injury, the CoolMax fabric moves perspiration away from the body to allow you to feel cooler and more comfortable whether active or stationary throughout the day. Check out our complete collection of supports for all parts of the body.